Someone on Getglue described this as Star Wars + Xena + Fables. I can get with that description. Loosely based on Terry Goodkind’s Sword of Truth series (which I suppose I should read), the basics of Legend of the Seeker go like this: big bad (Darken Rahl), destined to be defeated by the Seeker (Richard Cypher), who is accompanied by a wizard (Zedd) and a Confessor (Kahlan Amnell). Follow their adventures as they try to help the resistance and fight off Darken’s D'Haran soldiers and the lovely Mord-Sith. Please excuse the “sith” part. Well, how can you not excuse it when the Mord-Sith look like this. 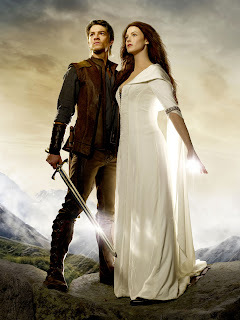 Aside from that and other basic similarities to fantasy shows we’ve met in the past, Legend of the Seeker manages to hold its own well enough for me, with no little credit going to the characters and the actors who play them. I might also add that the introductory episodes managed to mostly avoid the cheesiness of too much bad CGI and overacting and trying to take itself too seriously but not taking itself seriously enough that sometimes infects this genre. My only real complaint is the way the show keeps teasing me with PoC characters. It’s done a reasonable job of including a good amount of colour in the villages and several plot-based characters have been PoCs, but dammit, Chase, why do you keep going back to your family instead of tagging along with the Seeker’s merry band? He needs you. I need you! I also originally complained about the whole impossible love trope that so many shows love to include because DRAMA! Despite having strong and obvious to everyone feelings for each other, a Seeker and Confessor can’t get it on because of the Confessor’s abilities. We won’t discuss who made up this awesome plan to have the Seeker always team up with a Confessor in spite of this problem. I was concerned that they’d drag out this tension forever – and it did last through the first half of season one, at least, and is often a part of the plot, but kudos to the team for allowing Richard to come to terms with the fact that their love can’t take the path of passion. Kahlan still stresses a bit over it, but Richard displays a wonderful understanding of love, romance and friendship. Get Free Tickets to the ‘Booksmart’ Advanced Screening, Chicago!